On the night of Tuesday, November 22nd, 1938 the Jewish public was backed by their multi-ethnic community in Boyle Heights in protesting the Nazi savagery being inflicted on the Jews of Germany and Austria in the days following the eruptions of Kristallnacht. The protest parade was backed by the Jewish Labor Committee (JLC), and organized by a more diverse coalition known as the United Anti-Nazi Conference (UANC). Also supporting this event, was the Hollywood Anti-Nazi League (HANL) and the Los Angeles Jewish Community Relations Committee. (CRC). Source: “Visions of a Jewish Future: the Jewish Bakers Union and Yiddish Culture in East Los Angeles, 1908-1942.” Caroline Elizabeth Luce, UCLA 2013. 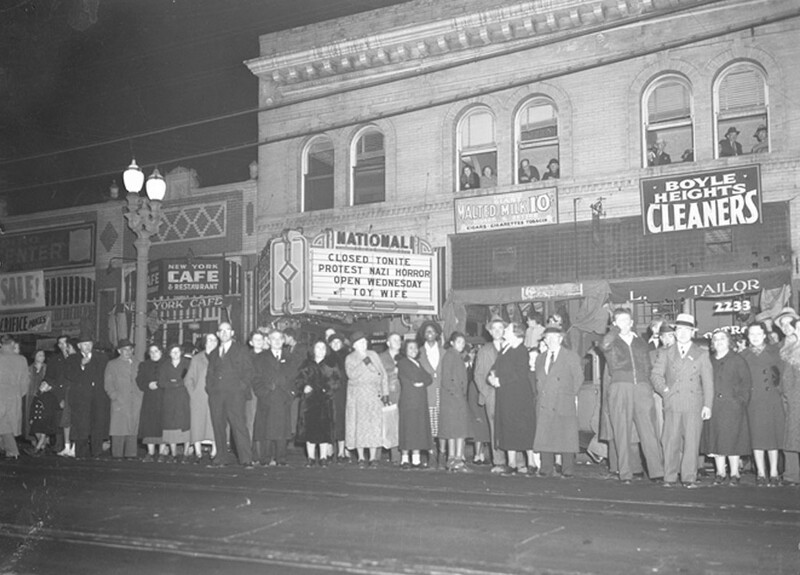 The Los Angeles public in Boyle Heights was on that night responding to the wave of anti-Jewish violence in Germany which had begun less than two-weeks before on the night of November 9th, 1938. And which for two days ripped through the entire German Reich with brutal, coordinated attacks against its Jewish population. The event became known as Kristallnacht – the night of broken glass, so named because every Jewish community in the German territories were left covered in shards of broken glass in the end. The shattered remains of the countries synagogues which were damaged, and in many cases destroyed. And the broken storefronts and display cases of Jewish businesses, which were also smashed and looted. During this wave of violence some Jews were beaten to death by Nazi brown-shirts and police, while others were sadistically forced to watch. Even a few non-Jewish Germans – who were mistaken for Jews – were beaten to death. The violence of this pogrom directly resulted in the deaths of 91. Though hundreds more were believed to have also died as a result of panicked suicide amidst the violence. 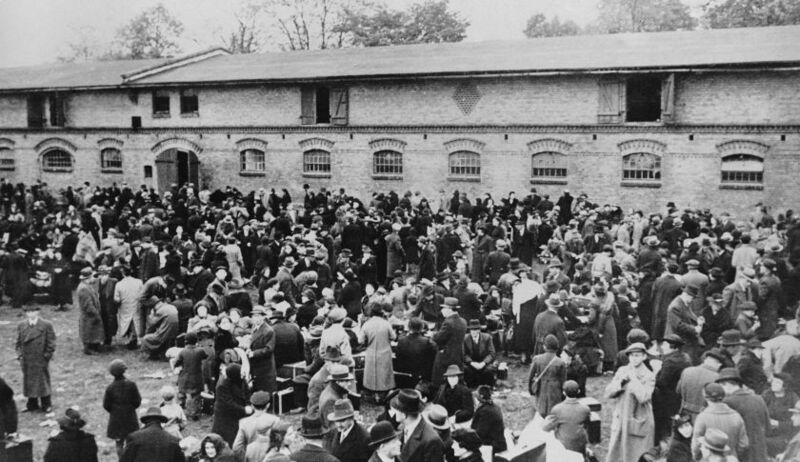 Also during this operation the world would get a startling preview of the holocaust, as more than 30,000 Jewish men were arrested and taken to concentration camps; primarily Dachau, Buchenwald, and Sachsenhausen. The treatment of prisoners in these camps was brutal, resulting in the deaths of some 2,000 to 2,500 men. Though, most would eventually be released during the following three months, on the condition that they leave Germany. The problem was, there was no place for these people to go. In nearly every place in the world the conditions were such were Jews were being expelled from their home countries, while other countries restricted immigration to the resulting unwanted refugees. It needs to be stressed to this generations – which is so far removed from the realities and the context of the humanitarian crisis of the time – that this event was not the start of the refugee crisis. It was the mid-stream result of one! And it also needs to recognized that while these pictures here may arouse a communal sense of pride – in that the diverse people of our local community responded to such violence and inhumanity by loudly demonstrating for the United States government to accept more refugees – we ought to soberly reflect upon the fact that the American public did not want these refugees. Looking back at this event, I am struck by the realization that these protesters were here pleading the case of Jewish refugees a year prior the start of World War II – three years before the US would enter the war – and before start of the holocaust. In these photos we are looking upon a pivotal moment prior to these tragedies, when many Jews could have been saved from the coming calamity. I cannot help but be grieved by this realization, that our community’s activism and protest which we see in these pictures went largely unheeded. That these cries to save our Jewish brothers from one of the most brutal regimes in history, they fell on the deaf ears of an isolationist and racist American public of that era. However, we will see that these early organizing efforts to unify the community for civil rights gains were not entirely fruitless! Skits were perfored in Yiddish and English reenacting acts of Nazi persecution. As we further delve into this history we will explore the nature of the refugee crisis of their day, as well as the prejudices which caused and further enabled it all. Prejudices which were not only present in Germany, but also in our own county. And we will lastly explore how alliances between Jews and our multi-ethnic neighbors were forged in order to fight such prejudices through joint activism. As these collaborations would actually live on past this crisis, directly inspiring continued cooperation between our minority communities in civil rights activism for decades to come. When the Nazi party came to power in 1933, their well-announced aim was to make Germany judenrein – cleansed of Jews, who were being scapegoated for the societal and economic issues of the country. This they tried to achieve by making life so difficult for Jews that they would be forced to leave the country. Including baring them from most trades, professions and educational institutions; as well as limiting their rights of full-citizenship. Then in 1935 with the enactment of the Nuremberg Laws, the Nazi Germans government began stripping the citizenship and residency of Jewish people of foreign ancestry; including persons who themselves were actually born in Germany. This resulted in leaving many Jewish people not just jobless, but also stateless. By the start of 1938, a quarter of the German Jewish population – some 150,000 people – had already left the country. Though this crisis went from bad to worse when Germany invaded and annexed Austria in March 1938, bringing another 185,000 Jews under Nazi rule. This left hundreds of thousands of Jews waiting in desperation for any country in the world to open their gates to them. “Many German and Austrian Jews tried to go to the United States but could not obtain the visas needed to enter… Americans remained reluctant to welcome Jewish refugees. In the midst of the Great Depression, many Americans believed that refugees would compete with them for jobs and overburden social programs set up to assist the needy. As we see, even in the United States the feeling was that we did not have the resources to help these people. And even in this country, there was still the widely held sentiment at the time that Jews were racially undesirable as well. With nowhere to go, the Jewish refugees of Germany and Austria were being pushed from one place to another. Which was an issue of great concern to the world powers. Under great political pressure, President Franklin D. Roosevelt had called for an international conference which took place in Paris in July of 1938, to address the refugee crisis. “In the summer of 1938, delegates from thirty-two countries met at the French resort of Evian. Roosevelt chose not to send a high-level official, such as the secretary of state, to Evian; instead, Myron C. Taylor, a businessman and close friend of Roosevelt’s, represented the US at the conference. During the nine-day meeting, delegate after delegate rose to express sympathy for the refugees. But most countries, including the United States and Britain, offered excuses for not letting in more refugees. Despite the international community recognizing the reality of the crisis at hand and the tragedy unfolding, they collectively choose to do nothing. The only country willing to open their doors to these Jews fleeing Nazi Germany, would be the small island nation of La República Dominicana. It is my strong belief that this disregardance given by the international community to the plight of these Jewish refugees emboldened these next and further sufferings to be inflicted upon Jews. The next month in August 1938 the German government began the process of canceling and demanding renewal of all residency permits for Jews of foreign origins. This included German-born Jews of Polish descent who had lived in Germany for generations and yet who were not considered German citizens by legal birthright; due to their Polish Jewish ancestry they were deemed Polish by the Germans. While at the same time, Poland began announcing that it would not accept any more migrant Jews of Polish origins past October 1938. So on October 28, 1938 the Germans acted on Hitler’s order to round-up some 12,000 Polish Jews for “repatriation” and forcibly sent them over the Polish border, over 8,000 of which were immediately refused entry. Leaving thousands of refugees trapped without entrance to Germany or Poland, in the most dire of straights. Among the refugees was the family of one Herschel Grynszpan, who himself was born in Germany but was illegally living in France at the time. Who upon receiving news of his family’s suffering at the German-Polish border he worked himself up into such a frenzy that he decided to buy a handgun and in protest assassinate a Nazi diplomat in Paris, ultimately mortally wounding a third-level embassy secretary. It would be the news of the killing of a low ranking Nazi diplomatic staffer in Paris by a Jewish refugee on November 9th, 1938 which would be eagerly seized upon by the Nazis in order to erupt into and justify a much expected, large-scale attack against all Jews under the shadow of the German Reich. The Nazis were not really able to use this assassination as an example of an international Jewish conspiracy in the end, as they had hoped for in a potential catalyst. As Grynszpan clearly acted alone and could not be tied to a larger plot, furthermore his act was loudly decried by the Jewish establishment. Though this act did tragically present itself as the provocation needed in order to hold all Jews responsible for the crime of one desperate Jewish refugee, and to somehow vilify all Jews as dangerous illegal aliens as well. It was just the incident needed to seemingly justify the brutality and terrors of Kristallnacht, and to turn the corner towards a more intense form of violence against Jews under the German Reich. Considering all this, when we look back at the Anti-Nazi parade of 1938 we can now understand what these people were protesting against. Now we can appreciate the peril of the people they were demonstrating for. They were organizing to try to help unwanted Jewish refugees, whose lives desperately hung in the balance. The persecutions and difficulties of the Jews in Europe had not gone unnoticed by the American Jewish public and their allies here in the United States. As they had actually begun to organize protest against the Nazi fascists soon after they came to power and began enacting discriminatory laws against Jews. The Jewish Labor Committee (JLC) was formed in 1934, in response to the rise of Nazi persecution in Europe. Bringing together several Jewish labor factions for their cause. Fighting for better treatment of laborers, and raising awareness regarding the dangers of European fascism. “The UANC defined their fight against fascism on much broader terms than the JLC. Their goal was not simply to raise awareness about the Nazi threat in Europe but to encourage the public to see that the same fascist attitudes that propelled Hitler to power in Germany also maintained the Jim Crow system and perpetuated racial and economic inequality in America. United Anti-Nazi Conference protesting, with the police restraining them. “Los Angeles was particularly susceptible to fascist influence because of its tradition of ‘fascist jurisprudence’ – the LAPD’s arrests of those seeking to distribute literature, protest or otherwise exercise their first amendment rights – and because Hollywood was a ‘fertile field’ for anti-Semitism because of Jewish executives’ ‘ruthless management’ of their studios. To this end the UANC was organized and began addressing the underlying causes of fascism – manifest in racism, segregation, persecution of immigrants, and antisemitism – which was also present in our own society. And to counter the demagoguery which was seen not just in Nazi Germany, but also mirrored in our own country. Though I believe one of the most important characteristics of the UANC was that they understood the need for addressing the very real issues which were being seized upon by anti-Semites and racists in our very own city of Los Angeles. Instead of dismissing and deflecting, they engaged both the rhetoric and also the uncomfortable truths head-on. They took much more than a nuanced approach, they fiercely took-up addressing the fears and phobias; even when this came with harsh criticism of the Jewish establishment in Hollywood. Yet while Jews had a presence in the Hollywood film industry, we need to understand that they were still outsiders in much of the larger society. And even Hollywood itself was no haven from antisemitism. This is actually most horrifically displayed in the bigoted reactions which were already elicited to the protest against Nazism and fascism in America. 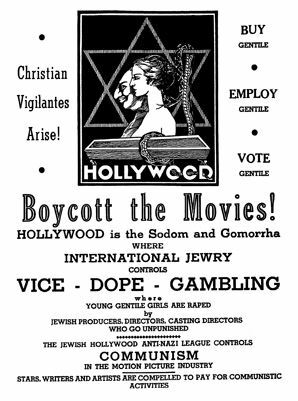 On October 1, 1938, ‘Box Office,’ a glossy trade weekly, reprinted a crude antisemitic leaflet circulating around theaters in the Midwest and, closer to home, along the streets of downtown Los Angeles. This was how antisemites responded to the public rallying calls against fascism by the studio funded Hollywood Anti-Nazi League. (HANL) Similar antisemitic leaflets would also be inserted into 50,000 copies of the Los Angeles Times by antisemitic employees. What we do need to remember is that in those days Jews in America were still considered a form of ethnic minority in many ways; othered in society, and even at times racialized. And therefore were still subjected to many of the harsh realities of discrimination and segregation. In fact the prejudices against Jews seemed to be peaking at this time, as some Jewish families were actually starting to successfully assimilate into middle-America; which came with alarm and repulse for many white Americans. As they saw some Jews begin to make inroads to where they were traditionally not welcomed. When we look at this era we see that the Jewish people were actually facing much discrimination on both ends of our society. Jews as a people were being vilified as Hollywood moguls, while also being despised as needy immigrants. They were being hated for being ruthless capitalists, while also being demonized as communists. They were scorned for wanting to be like white Americans, and detested for being too foreign. And during this point in history antisemitism had a particular appeal to many people, amid the Great Depression. In some of the same ways as how Jews were being scapegoated for the depression in Germany, antisemitism also surfaced here. Though what is also important to understand about this moment in history is that the Jewish people were not just fighting ambient racism. 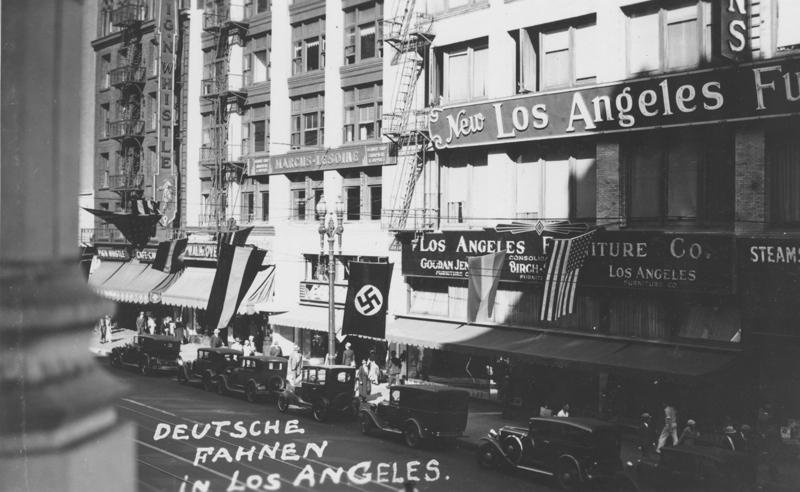 As in fact over in downtown Los Angeles on Broadway was located the western headquarters for the German American Bund, founded in 1933 as the “Friends of New Germany” – the American manifestation of the Nazi party and a pro-Nazi Germany advocacy group. Los Angeles and Hollywood itself was particular susceptible to this type of fascists ideology, in an atmosphere in which nationalism was still fashionable and Nazism was even romanticized. 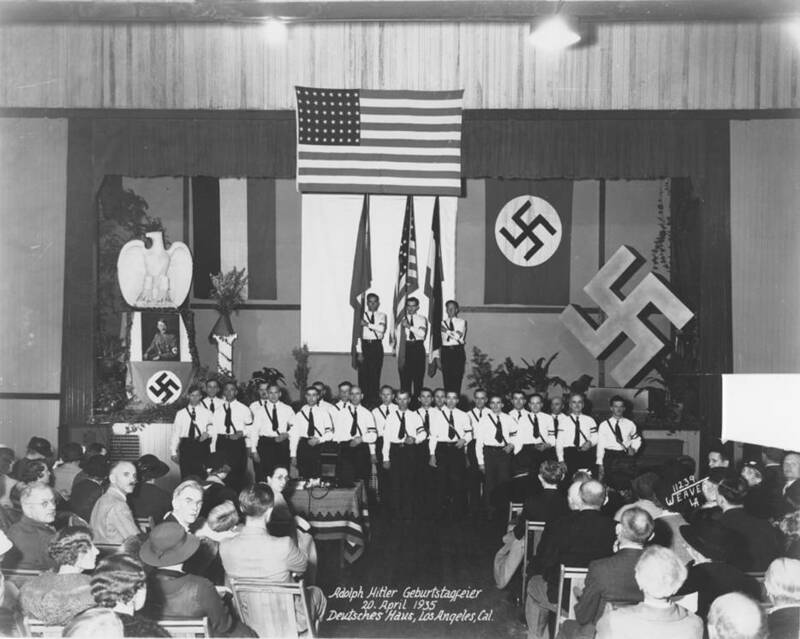 And in an age when it was common for people of society to attend controversial political meetings, national socialism was also to be found in the mix. As early as 1933 Los Angeles Jewish leaders responded to this threat by founding the Community Relations Committee (CRC) – initially created to monitor groups and report activities which were seen as a threat to Jews and to democracy in general. Monitoring groups such as the Bund, the Friends of New Germany, the Silver Shirts, as well as other antisemitic and racist groups like the Klu Klux Klan (KKK). Adolf Hitler Geburtstagfeier (birthday celebration), being celebrated in Los Angeles, April 20, 1935. Deutsches Haus Auditorium. The CRC was quite successful in infiltrating these organizations and exposing their realm of influence within the city. Which resulted in a dramatic decrease in the membership of the Friends of New Germany. Their successes in their fight against organized racism and in preventing violence positioned them as the leading organization within the Jewish community for years to come. “The CRC became a main organization occupied with the defense, protection and civil rights of the Los Angeles Jewish community in the 1930s. The CRC would eventually change their name, later becoming known as the Jewish Federation Council of Greater Los Angeles. As a small minority, the Los Angeles Jewish community at this time came to recognize that they had to partner with other minority groups in order for their voice to be heard. And their draw needed to be broad, as Los Angeles was such an ethnically diverse city that there was not any one nationality with which they could secure a powerful alliance. Organizations such as the CRC were among the first to realized that their goals were best achieved through broader partnerships with their non-Jewish fellows. For in practice they found that their fight for civil rights as Jews was very much similar to the civil right struggle of various ethnic minorities and immigrants, including African-Americans and Mexican-Americans. When Kristallnacht erupted in November of 1938, the Los Angeles Jewish community and their allies organizing the Anti-Nazi parade did not even attempt to hold the event in Hollywood or even downtown, but rather in Boyle Heights. And this was for a couple of reasons. First, because the Jewish public knew that they did not have the backing and clout to really hold a successfully anti-Nazi protest in Hollywood itself – let alone one which would attract broad and diverse support they were seeking. Which leads to the most importantly reason yet, to remind the public of the fact that what Jews were experiencing both in Europe and America was a struggle against racism. Holding the protest here in Boyle Heights reinforced the reality of this, tying this event to the struggle they were facing alongside their various immigrant neighbors and with people of color in this very community as well. For this reason, it should not surprise us that in these pictures capturing the Anti-Nazi protest of November 1938, we also see the faces of black, brown and Asian people protesting alongside their Jewish eastside neighbors. His parents had come to the county as illegal immigrants through Canada, and then later settled in Boyle Heights. Troubled by the situation of the Jews trapped in Europe, they marched to demand the admittance of the refugees and were joined by their comrades of all the various nationalities of the community; some 15,000 marched for the admittance of Jewish refugees, three years before the United States entered World War II. This partnership between Jews and with other minority groups beginning with their fight against fascism and their public education campaigns against racist ideologies in those pre-war years constituted one of the first major joint effort in civil rights activism between the communities. And the lessons learned at that time would provide a working model for inter-racial cooperation which would be followed for years to come. After the US entered World War II – when it was no longer necessary to convince the American public of the Nazi threat – the focus of Jewish organized civil rights clearinghouses such as the CRC would be redirected to the then most poignant issues at hand. While still maintaining their founding principles to addressing the causes of antisemitism and race related violence, as the nature of ethnic tensions would shift. And in the post-war years the CRC would continue to back and support civil rights work, with specific focus on the Los Angeles eastside. When after the war it seemed that Jews and the local ethnic minorities appeared to have less in common with each other, revealing many fears and racial tensions which then needed to be addressed. At a time when antisemitism and race-based scapegoating came with different challenges for the community. In our continued exploration of this history, we will later see how in the post-war years the CRC addressed inter-community tensions and racial inequality, though supporting the empowerment of our local ethnic minorities. Ultimately providing essential backing and funding for groups such as the Community Service Organization (CSO); which would become our first major Mexican-American civil rights training ground in the area, out of which leaders such as Cesar Chavez would eventually emerge. Resolving Conflict and Preventing Racial Violence, in the Classic Eastside – Post-WWII community organizing and civil rights work. A brief history of how Jewish immigrants lent their acquired experience in organizing to more recent Latino immigrants. Two girls wearing banners with slogan “ABOLISH CH[ILD] SLAVERY! !” in English and Yiddish (“(ני)דער מיט (קינד)ער שקלאפער(ײ)”, “Nider mit Kinder Schklawerii”), one carrying American flag; spectators stand nearby. Probably taken during May 1, 1909 labor parade in New York City. During the 1920’s, many workers such as fieldhands, miners and fishers went on strike because of huge pay cuts. They also weren’t happy because their pay was being lowered but they were still forced to pay the same amout of tax. This led to huge strikes and many of the worker’s families were starving because they were not being paid at all. After an initial period in East Coast and the mid-west cities, significant numbers of Jewish immigrants and their families drawn by the economic boom, move to Los Angeles, eventually making Boyle Heights home to largest Jewish community west of Chicago. In 1933, the Los Angeles garment industry employed nearly 7,500 workers, half of which were scattered in an estimated 200 small sweatshops in the downtown garment district. Latinas comprised nearly 75 percent of those workers, with the rest consisting of Italians, Russians and Americans. Jewish-Latino relations in the US are built upon a legacy of recognizing a shared immigrant and working-class experience. We have a long history of being natural allies in promoting social advances. And it all began with organized labor. At the start of the 20th century an influx of impoverished Eastern European Jewish immigrants provided this country with a desperate and eager labor force. Many of these new immigrants going into the garment and dress-making industry. However, the working conditions in this era of the industrial revolution were terrible and even deadly. Women laborers such as these were among those who organized as early as 1900 in New York City, founding the International Ladies Garment Workers’ Union (ILGWU). Often holding meetings in Yiddish. With immigrants venturing west and industry taking off in the booming years of Los Angeles, ILGWU became established here in 1910. “On September 15, 1933, a young, New York labor organizer by the name of Rose Pesotta landed in Los Angeles. Pesotta once worked in Southern California where she had been discharged from a garment factory and blacklisted for union activity. Now Pesotta was returning at the request of garment workers to organize their industry. Within one month a new International Ladies Garment Workers Union (ILGWU) local was formed and the garment industry found itself in the middle of a bitter strike with Rose Pesotta leading the charge. “In 1933, the Los Angeles garment industry employed nearly 7,500 workers, half of which were scattered in an estimated 200 small sweatshops in the downtown garment district. Latinas comprised nearly 75 percent of those workers, with the rest consisting of Italians, Russians and Americans. Nearly half of the female dressmakers made less than $5 a week, which stood as a clear violation of the $16 a week California minimum wage for female workers and National Industrial Recovery Act’s (NRA) Dress Code, which set standards in the industry. Workers who attempted to organize were routinely fired and blacklisted by the employers. The local leadership of the ILGWU, consisting of mostly white men, had no interest in organizing female dressmakers, feeling that most either leave the industry to raise their families or shouldn’t be working in the first place. “In sections of the Bronx, in the West Side section of St. Paul, Minnesota, and in the Boyle Heights area of Los Angeles, Spanish-speaking Latinos replaced Yiddish-speaking Jews as the newest immigrant group. “Organized labor often served as a bridge between these working-class, ethnic communities. Unions also provided a political voice for the emerging Latino community. “The International Ladies Garment Workers’ Union (ILGWU) served this function on the Eastside of Los Angeles. The ILGWU engaged directly in civic life. It also helped establish and worked through a variety of Latino and Jewish and organizations, as well as broad-based civil rights coalitions. “The groups in the ILGWU’s sphere of influence included the Jewish Labor Committee and the Mexican American-oriented Community Service Organization (CSO). Early CSO leaders included Maria Duran and Hope Mendoza from the ILGWU. The historic influence of the Community Service Organization (CSO) in Latino civil rights and politics cannot be overstated. Royball would ride a wave of crucial Yiddish speaking political support in Boyle Heights, backing his ascent to City Hall and further still. The future Congressman Edward Roybal would later take his social causes to the halls of the US Congress with him as well. Fred Ross would continue to expand CSO at the behest of Alinsky, helping establish their presence first in Oxnard and later in San Jose. Cesar Chavez and Dolores Huerta, trained by CSO in Alinsky style protest, would then take the cause directly into the local fields; thus founding the United Farm Workers, which is widely considered the most influential and visible Latino organization to date. 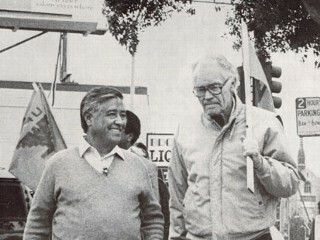 The UFW is the primary historical and still active model for Latino activism to this day. While today American Jews might not be the face of the working-class anymore, many Jewish community leaders have made it an activist goal to fight for workers rights and better immigration reform for Latinos. Maintaining a legacy of support for these and other progressive causes, due to the similar collective memory Jews have of their grandparents and great-grandparents being exploited as poor immigrants.